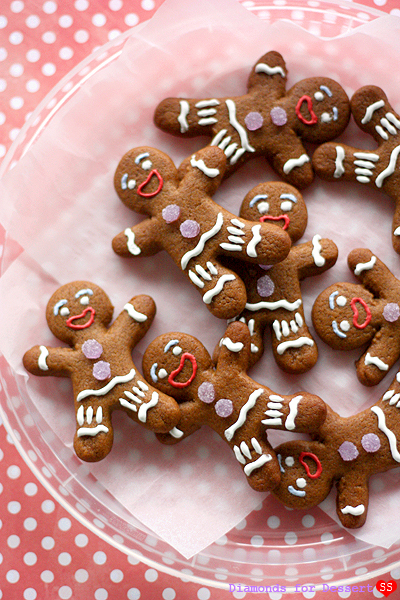 Yes, that's right: "Gingy"-bread Men. Anyone here like Shrek? Well, my favorite Shrek character happens to be Gingy! 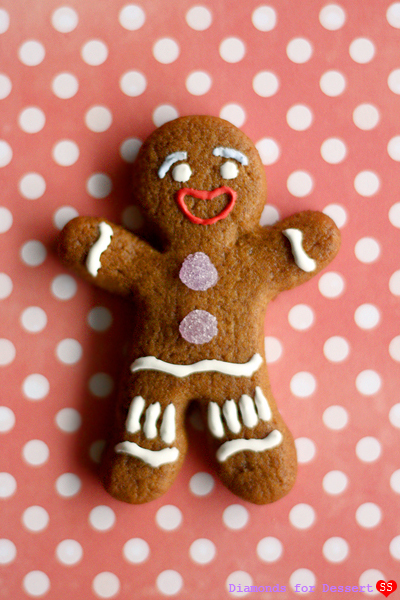 So I thought that this year, instead of the minimal gingerbread men decoration that I usually do, I would decorate my cookies to look like Gingy. I used my favorite thick and chewy gingerbread cookie recipe and opted to decorate the cookies with a traditional royal icing. What makes Gingy so "Gingy-like" are: white squiggles, white leg stitches (after he's tortured, of course), white dot eyes, a red mouth, and lavender eyebrows. Oh, and of course his purple gum drop buttons. My favorite part of these cookies are definitely the candy buttons. Hope you're all having/had a wonderful holiday break! 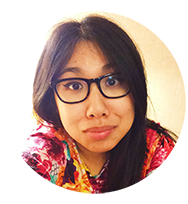 Today I have a quick post to start off my holiday cookie blogging. 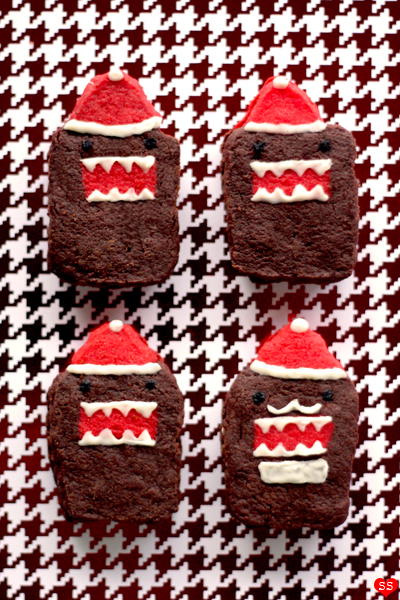 It's a twist on my Domo TKOs... a tutorial for Christmas Domos :). But, the main point of this post is to give you all a preview of all the cookies I made for Christmas, which I'll be blogging about in the next few posts. 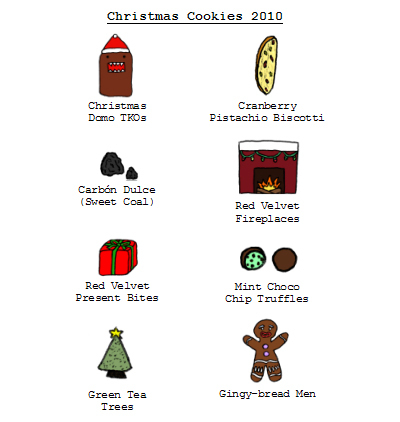 Here is the cartoonized version of my Christmas cookie list. An actual picture of all the cookies is posted at the bottom of this post. 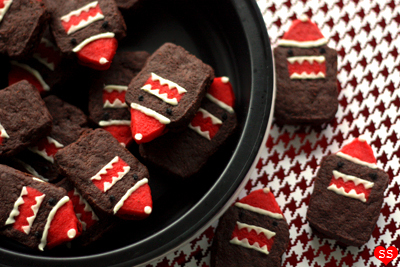 While I was making these Domo cookies, I realized that by adding different hats, they can be used for all sorts of occasions (sort of like Kirby in Super Smash Bros after sucking up different characters). Change the red hat to green and you have Elf Domo. Change the white cotton on top to a pom pom and add polka dots and you have Birthday Domo. A blue hat with stars makes Wizard Domo. Add the year and you have New Years Domo. Think of all the possibilities :D! Sorry for being MIA, but finals are coming up and I've been busy studying and writing papers :(. But luckily, that means that a week from today, it'll be winter break and I'll be free to turn on the Christmas music and start baking my Christmas cookies. I can't wait! This week though, I thought that I'd post about something fun, a little something to brighten up the day. 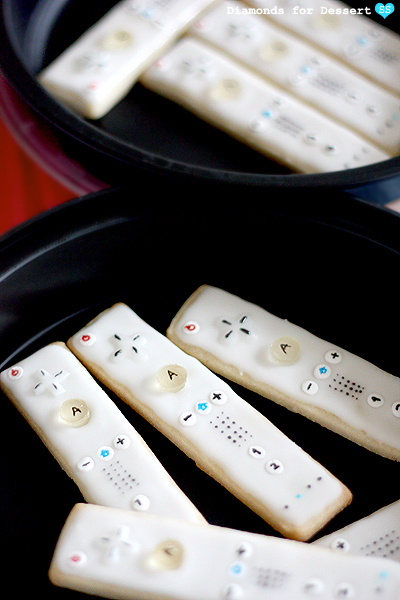 Remember the controller cookies I posted about back in April? 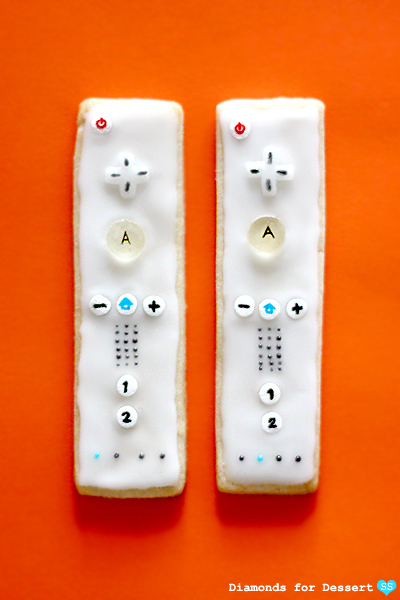 Well today I'm adding another controller to the bunch: Wii Controller Cookies. I enjoy making controller cookies because it gives me an excuse to browse the candy aisles at the supermarket. I ended up getting white "mystery" Airheads and confetti sprinkles for some of the buttons. Sadly though, I couldn't seem to find a clear candy to use for the "A" button. But no worries, I just ended up making my own clear gummy candy buttons :).